I'm only a newbie here but thought I'd post this up to see what I could find. Wh9ile I'm not strictly speaking in New Zealand, I did get this site recommended to me because I'm just over the pond in Oz. I've recently become the owner of a BBC Micro (upgraded to support disk drives and EcoNet). At this point, it's the machien only - and I've tested it and it currently works. The only downside is I don't have any storage for it. I'm hoping to find a (reasonably) local source of a disk drive for it so I can attempt to turn it into something useful. As I'm a newbie and in Australia, I expect peopel to be a bt cautious - I can understand that - but I may as well ask and see what I can turn up. You might also consider this device I reviewed here. They are sold on e-Bay regularly. Some PC 5.25 drives can be used with the BBC with a bit of modification. If you can find one with jumpers on it, and you don't mind making up the cables, there is a way to make them read BBC discs. You need to make them spin at 300 RPM I recall. Setting jumper DS0 rings a bell too. Last edited by MisJiF on Tue Mar 11, 2014 2:05 pm, edited 1 time in total. Yes, that's the secret. They need to spin at 300. Some 5.25 inch PC drives had a jumper to change the speed but not all of them did. Go with Tezza's original reccomendation, the MMC drive can be purchased from Retroclinic on Ebay, they also do an external version which requires no soldering and provides you with virtual hard/floppy disks and usb connectivity. I have a BBC master128 with an onboard MMC and it is loaded with just about every piece of software ever released on the machine, classic gaming with no trailing wires. If you really want to go down the purist route - various drives are available for the BBC and can regularly be found on Ebay, the most common ones being Acorn, Watford and Cumana-just the problem of postage to consider. tezza wrote: Hi and welcome to the forums. Terry I was wondering why you added a pull-up? resister to your MMC EPROM? RonTurner wrote: Terry I was wondering why you added a pull-up? resister to your MMC EPROM? I didn't add anything to mine Gavin. What made you think I did? Perhaps mine is a different version from whatever it is you're referencing? tezza wrote: You might also consider this device I reviewed here. They are sold on e-Bay regularly. photo shows a 4.1Kohms Pull-Up resister soldered onto pins 28 & 1 (Vcc & Vpp) of your MMC EPROM ? Last edited by RonTurner on Mon Apr 28, 2014 2:46 pm, edited 2 times in total. Ah, I see. That resistor came already soldered on to the EPROM. You can just see it in the first photo in the article. I have no idea why the developer put it there? my mistake, I thought you must have mod'd it to make it work or something. I was just looking at this section because im going to get one of those system-80 drive emulators , for some reason my drives dont work, so I might as well just throw a drive emulator at it. Interesting. I don't have that on mine. 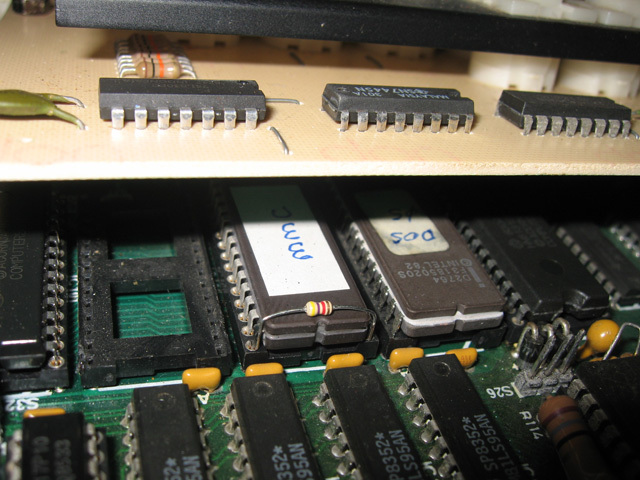 Next time the BBC is out I must check if Pin 1 is tried to VCC on the PCB. It may not be so would be floating without the pullup resistor which may cause problems... with some EPROMs anyway.